In this page you will find some screenshot taken from our demo and samples programs. 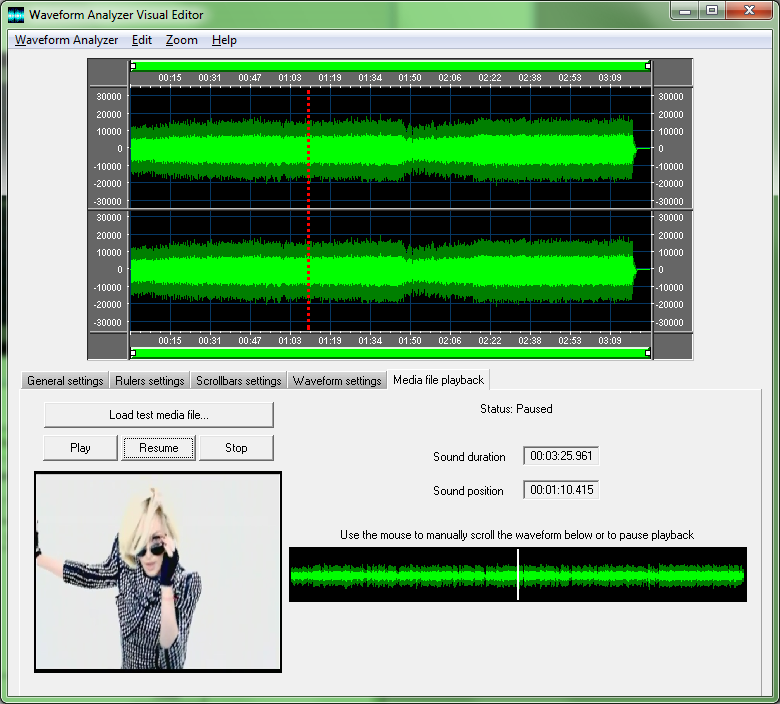 On the screenshot below you can see the user interface of the Waveform Analyzer Visual Editor during the playback session of a video clip: the current playback position is displayed and automatically updated on the waveform area through a dotted red line (color, dot mode and width are obviously configurable) and the waveform scroller near the video clip window is automatically updated. On the screenshot below you can see a small stereo audio track: both left and right channels can be displayed separately and a couple of scrollbars (the green rectangles on top and bottom of the picture) allow zooming and panning over the waveform representation by horizontally moving the small white squares (handles) through the mouse.